CCPD relies on the subtleties of the sensations, qualities and structure of the radial artery at both wrists. Heavily steeped in ancient wisdom and classical pulse diagnosis dating back thousands of years, CCPD breaks out of the dogma of pulse systems that in many respects are not relevant to the present day and age. CCPD provides insight into the modern diseases and constitutional imbalances that affect modern man in an industrial world. The intricacies of CCPD are complex and require significant amounts of hands on training with a certified teacher to fully learn. Essentially, however, information is synthesized from the combinations of various qualities felt at the 6 principle pulse positions and the 22 complementary positions, as well as the qualities perceived uniformly over the entire pulse and at each of the requisite depths (8 of them). Integrating the information from these seemingly disparate parts, one is able to arrive at a complex diagnosis, which prioritizes levels of imbalances of not just the symptomatic representations, but more importantly the root causes of disease. Incorporating concepts and clinical realities that have not been diagnosed by any other diagnostic method in Chinese medicine, CCPD is truly a treasure which can change the lives of patients. By incorporating a precise measure of a healthy balanced pulse, even the subtlest deviations from this norm can be detected, thus establishing its importance not only in treating disease, but also as a preventative medicine. Learn more about Contemporary Chinese Pulse Diagnosis lineage from this link. And click here to watch a webinar by Ross Rosen teaching on the Shen-Hammer pulse. Ross has also trained extensively in and is certified to teach Classical Chinese medicine and classical pulse diagnosis with 88th Generation Daoist priest and doctor of Chinese medicine, Jeffrey Yuen. Ross incorporates the classical pulse model, including overlaying all the meridian systems (cutaneous, sinew, luo, primary, divergent and extraordinary) and classical theories and energetics with the detailed anatomical and systems model of CCPD to create incredibly detailed and sophisticated diagnoses and treatment integration. Utilizing Shen-Hammer and Classical Pulse models, Ross has created a synthesis of the two into a powerful comprehensive approach. Within this model, Ross can cross-reference energetics and theoretical concepts to provide a more detailed clinical picture and allow for more tailored treatment strategies and interventions. Simultaneously, Ross can focus on identifying wei-defensive level energetics and sinew meridians (and their relationship to Shang Han Lun) as well as qi-depth and nervous system pathologies, luo-ying level pulses and their psychosocial developmental relationships as well as blood depth pathologies and Dragon Rises, Red Bird Flies psychological profiles, organ depth and yuan level energetics of the divergent channels and 8 extraordinary meridians. Layering in directional/dynamic pulses Ross is able to see additional relationships that may reveal blockages and poor communication between organs systems. Additionally, this comprehensive model allows for and identification of personality, constitution and organ system energetics to determine if each organ and element/phase is able to perform it’s specific myriad functions, e.g., whether the Lungs can rectify qi or ‘let go.’ Using the above, Comprehensive Pulse can elucidate the varied ways of treating diagnoses by choosing strategies from the systems demonstrating most ‘active’ signs. Examples include whether or not to use the sinew channels, divergent meridians, etc. in the treatment of Heart Shock, or via a luo vessel psychosocial approach blending Dragon Rises, Red Bird Flies psychology. It helps to flush out and elucidate the exact nature and locations of retained pathogens and provides tremendous insight into the structure of Dr. Shen’s formulas. The applications are so numerous as it allows for a direct and real-time interplay between the Shen-Hammer and Classical lineages and gives access to a vast combination of their theoretical frameworks. 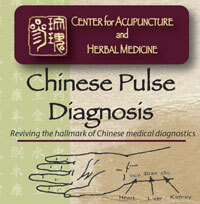 Chinese pulse diagnosis is the hallmark of Chinese medical diagnostics. I have been intrigued by it as long as I can remember. As a student learning Chinese medicine, one can’t help but feel so disappointed in the lack of training received in this art and science. For me, it was an unbearable frustration that led me to seek out and study with Dr. Leon Hammer. In Chinese medical school I was exposed to Dr. Hammer’s Dragon Rises, Red Bird Flies and some of Dr. Hammer’s articles from www.dragonrises.org and knew instinctively that this would be my teacher. Looking back now 17 years, I am honored to call Dr. Hammer my teacher, mentor and dear friend. What may shock people is that when I think of my experience with Dr. Hammer, my training in pulse diagnosis is not the most important thing I learned. What I am most impressed with and most try to emulate is Dr. Hammer’s ability to understand his patient’s suffering and perception of his/her illness, his ability to make contact with patients and enter into a sacred therapeutic relationship. The pulse is a tool for this process and informs the diagnoses, and acts as a catalyst or jump start in the formation of this healing relationship. Most practitioners who are aware of Dr. Hammer generally think of pulse diagnosis, and for sure, this is a tremendous area in which he has contributed to the medicine. I will speak more on this in a minute. But what people are unaware of is an entire body of knowledge that Dr. Hammer has synthesized into what we call Contemporary Oriental Medicine, or COM. COM is a dynamic, integrated model of diagnosis and treatment based on the experience of Dr. Hammer which at last count includes over 100 unique concepts not included in TCM. Concepts that reflect the realities of Chinese medicine as an evolving medicine relevant to the present day and age. Such concepts include: birth traumas and Heart shock, toxicity, Liver qi and yang deficiency, the separation of yin and yang as precursors to significant and debilitating illnesses, etc. CCPD relies on the subtleties of the sensations, qualities and structure of the radial artery at both wrists. It is a complex system that synthesizes information from the combinations of various qualities felt at the 6 principle pulse positions and the 22 complementary positions, as well as the qualities perceived uniformly over the entire pulse and at each of the requisite depths (8 of them). Integrating the information from these seemingly disparate parts, one is able to arrive at a complex diagnosis, which prioritizes levels of imbalances of not just the symptomatic representations, but more importantly the root causes of disease. CCPD can diagnose the subtlest changes in physiology making it invaluable as a preventive tool. It has the most sophisticated measure of a balanced healthy condition and detects the process that is moving one away from this baseline. I refer those interested in learning more to the Dragon Rises Seminars website at http://dragonrises.org. There is a wealth of articles written by Dr. Hammer as well as myself and my colleague Brandt Stickley. 6. is balanced between superficial, middle and deep depths with the most substance at the deepest or Organ depth and becoming lighter as one ascends to the Qi depth. 12. has a Wave reflecting a Sine curve that begins at the Organ depth and gradually rises to the Qi depth, and then subsides again to the Organ depth. With this checklist of a dozen characteristics, it really informs about what to be on the look out for. Deviations from this Normal pulse is significant wherever it is found. Another very important aspect of pulse diagnosis is methodology. CCPD is practiced in a very specific way: First, the rate and rhythm are taken followed by the uniform qualities felt over the entire pulse (this means with all six fingers over the pulse positions; three on each wrist). This provides the grossest level of information that the body is trying to convey; things that are happening systemically. By treating based on these messages alone, one can achieve significant results for one’s patients. In addition, keeping in mind these diagnoses while interpreting the rest of the pulse picture and treating accordingly can provide profound improvement. After evaluating the uniform impressions, one takes a look at each wrist individually. Interpreting the left side by itself and what it represents (the organ systems) and then the right side (the digestive system) can provide additional useful information. Next, one palpates once again with both hands on all pulse positions and examines the 8 depths. The next stage is to assess the pulse wave and how the pulse rolls over the pulse positions. There are 5 major waves which we analyze, again, each with differing messages being conveyed. They are: Normal, Hesitant, Flooding Excess, Flooding Deficient, Full-Overflowing and Suppressed. Lastly, the 28 pulse positions (6 Principle positions and 22 Complementary positions) are palpated to narrow the focus and perceive messages from the individual organ systems and areas of the body. In this way, one does not lose the forest for the trees or vice versa and is able to see the larger picture and the individual parts simultaneously and synthesize this information into a complete health picture. The other significant aspect of feeling the pulse is to make sure one is in the proper position as well as accessing the principle impulse. Often the inability to feel the proper quality and hence message the body is trying to convey is due to being in the wrong position or not having one’s finger directly over the principle impulse on the artery. When done properly and expertly, pulse diagnosis yields the most incredible information; so much information that it can seem overwhelming initially. This is truly one of it’s gifts; being able to interpret, synthesize the seemingly disparate parts of the pulse and one’s physiology/pathology into a coherent and brilliantly perceptive list of diagnoses that includes one’s psychological root imbalances and adaptations. From the pulse alone, one can diagnose a significant amount of psychological characteristics, such as anxiety and panic, depression, feelings of resignation, anger, grief, vengefulness, obsessiveness, confusion, etc. Diagnosing and understanding the psychology of the patient becomes important and to some degree is really the essence of what we aim to understand in order to more completely help our patients. To understand the root of one’s emotions and lifestyle and habituations and to counsel our patients to make the necessary connections and corrections is practicing Chinese medicine at it’s highest potential. It is about engendering awareness.